568 g per pair size US M10, or 10.0 oz per shoe. What makes a “good” running shoe depends on myriad factors: the shape of your foot, your gait, the terrain you like to run on, the conditions, the distance you plan to go, etc. It is also very much a matter of personal taste. 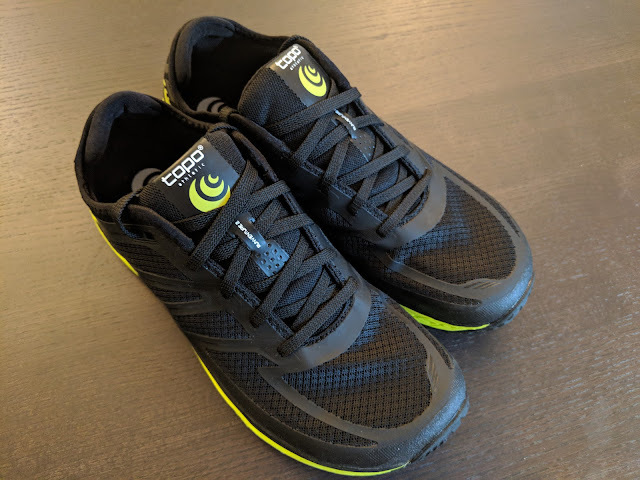 I’ve had good experiences with Topo’s trail shoes. I wrote a positive review of an early iteration of their MT-2 here on RTR. I also liked the Terraventure, which was reviewed on RTR by Jeff Valiere. My first pair of MT-2 fell apart (literally), but I liked the shoe enough that I ordered a second pair. According to Topo, the MT-2 has been revised to improve durability and I’ve not experienced any premature deterioration of the second pair. I recently wore them for the 72-ish mile Georgia Death Race. I felt that the MT-2 got everything just about right. It had a nice medium-wide toebox, good midfoot retention, moderate cushioning with the right amount of squish (to my taste, at least), a heel that wasn’t overly flared; no funky ‘stability’ features; great ground feel and nimbleness. All this -- crucially -- at a great weight. Really, my only criticisms of the MT-2 were that the outsole tread was somewhat lacking in lug depth and that rock protection was slight. The Runventure 2 attempts to improve in both these areas. It has a deeper outsole tread, and incorporates an “ESS” rock plate in the forefoot. While some shoes take a bit of getting used to, right out of the box, the Runventure 2 felt instantly familiar, unobtrusive, and reassuring. I literally didn’t notice that I was wearing a new shoe. My past experiences have led me to be highly skeptical of rock plates in the sole of a trail shoe. Either they don’t provide meaningful protection, or they ruin the trail sensitivity of a shoe. Often they make a shoe so stiff that it actually becomes less stable: instead of allowing the sole to conform around irregularities, the shoe teeters on top of prominences and feels tippy. Additionally, rock plates add weight to a shoe and complexity to its construction. My opinion has been that rock protection is better improved just by adding a couple of millimeters of midsole thickness. Because it had a rock plate I was dubious about the Runventure 2. I also didn’t really understand how it fit into Topo’s trail shoe line-up. As I see things, the MT-2 is light in weight and lightly cushioned: I’d wear these for daily training, and for races up to 50 miles. For longer distances, unusually rough trails, or for runners who like a bit more protection, there’s the Terraventure. The characteristics of Topo’s trail shoe line-up are summarized in the table below. Cosmetically, I really like the look of the RV2. The upper is an understated, uniform black color, and the overlays are restrained and seem functional. Despite this low-key styling, the shoe remains striking and distinctive due to the fluo green midsole. Functionally, the upper is also excellent. Breathability and foot retention is very good. The shoe drains quickly when wet. Durability seems good so far. I’ve used the shoe pretty much every day for the last month, and any major weakness would probably be visible by now. Fully-gussetted tongue stops tongue migrating off to the side, and prevents ingress of grit. The tongue is lightly padded and fully gussetted. It also has is backed with a nice slippery fabric that helps slide into the shoe easy. I often experience tongue wander with shoes that are not burrito-style, gussetted, or that lack retention beyond lace loops. I had zero issues with the Runventure's tongue. Nice slippery fabric on lining of tongue helps foot slide into shoe. It's worth mentioning the heel counter, which is very flexible and unusually constructed with much less stiffening material on the sides of the shoe. 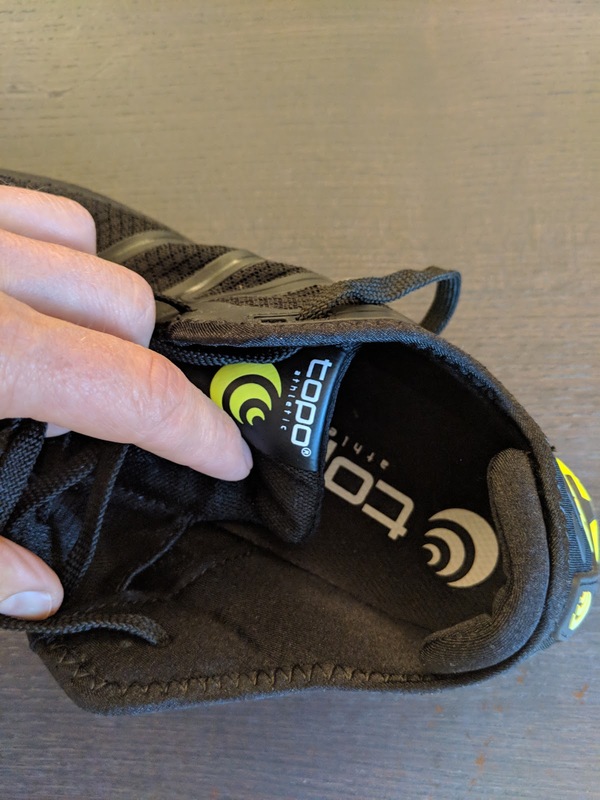 Topo Athletic’s founder and CEO, Tony Post, actually describes this as “no heel counter”, and certainly there’s no internal structure. I would call this an external heel counter. Either way, to my surprise, heel retention was absolutely fine: I noticed no looseness or instability -- and I have a narrow heel. Close-up of external heel counter. The only stiffening in the heel is this plastic overlay, shaped like an inverted 'T'. To my surprise, it worked just fine: I experienced no lateral instability. Note also the eyelets that retain the gaiters. Another interesting choice that Topo made in the construction of the shoe is that the heel collar lacks the traditional strip of foam padding. In the Runventure 2, the collar is just a folded seam of the neoprene-like fabric used throughout this area. I was concerned that this construction might allow more ingress of debris into the shoe than a conventional, padded collar that forms more of a seal around the ankle. I wonder if this is something that Topo have themselves fretted over, since along with the actual shoes, Topo also shipped a pair of lightweight trail gaiters. In my testing, however, I noticed no problems with this simplified construction. No foam padding in the heel collar. Looks unusual but seems to work just fine. In certain ankle positions, a gap can open up in ankle collar, potentially allowing debris into the shoe. 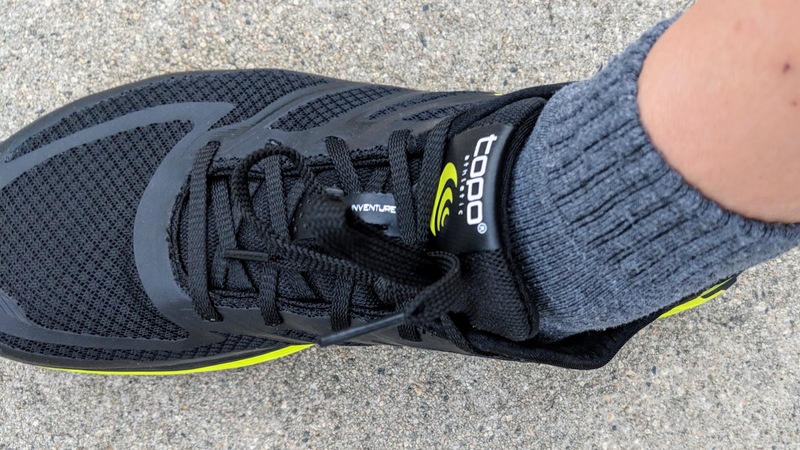 This proved to be more of a theoretical concern than a practical one: I didn't notice any extra dirt getting into the shoe during testing, but pairing the shoe with Topo's lightweight gaiters can eliminate the risk. The gaiters are worth discussing, since they are somewhat unusual. 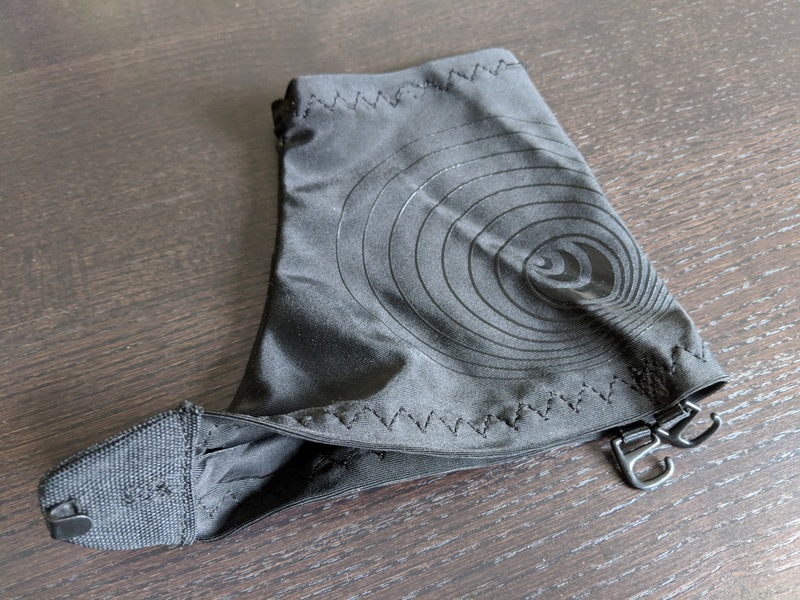 They are basically just a lightweight, stretchy barrier similar to the now-standard style of running gaiter popularized by Dirty Girl, and copied with minor variations by Altra, Inov-8, Salomon etc. The interesting part of the Topo gaiters is the way they attach at the heel. 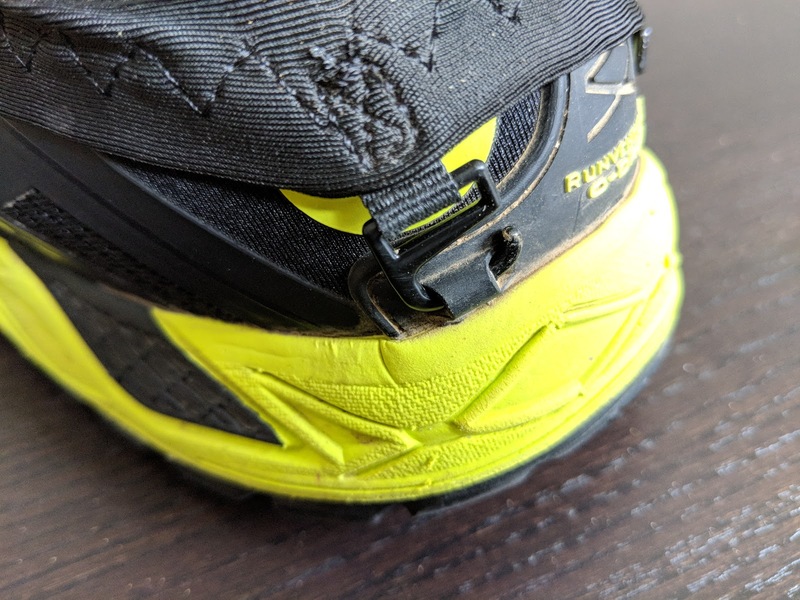 This is accomplished by means of two hooks in the gaiter that connect to two little loops low down on either side of the external heel counter of the Runventure 2. In my tests the gaiters worked well. I wore them in snow, in shoe-sucking mud, and in dusty, dry conditions. With my skinny ankles, the top was a little loose, but they still did a good job preventing ingress of foreign material, and were all but unnoticeable. Runventure 2 in the snow with gaiter attached. I did find that securing the gaiters is very fiddly. One criterion I use for evaluating gear is this: can I operate it in the cold, with numb fingers and wearing gloves? Can I operate it in the dark? While on the move? In the case of the new Topo gaiter attachments, the answer is ‘no’. The outside hook in particular was hard to secure. It was tricky at the best of times, requiring flexibility, dexterity, and clear vision. Attaching the gaiters would be all but impossible with numb fingers or wearing gloves. You would definitely need a headlamp in the dark, and it would be challenging if your vision is poor, or if your glasses/goggles are fogged or covered in rain droplets. Moreover, once the shoes have been exposed to mud without the hooks in place, the eyelets tend to get clogged with dirt. I encountered this during testing, and had to use a pin to clear the blockage. Another aspect to consider is that the hooks and receptacles have unproven durability. For casual runs, this is obviously relatively unimportant. But for serious undertakings, (e.g. if you were considering these for something like the Barkley Marathons) I’m not sure I would trust them. I definitely applaud Topo for seeking to try something new. However, I don’t see this as achieving the holy grail of simple, reliable, effective gaiter attachment. In the forefoot, between the topsheet under the footbed and the outsole there's little midsole material to provide cushioning underfoot. And with the rockplate also sandwiched in there, there's not much midsole material left. Consequently, the ride is on the firm side, and discussion of responsiveness and energy is almost irrelevant. However, to my surprise -- and I say this as someone who enjoys shoes that have a good amount of 'squishiness' to the midsole -- I didn't find the ride harsh at all. Because this is a zero-drop shoe, midsole thickness is similar in the heel. And here I think the shoe might benefit from a few millimeters of drop. If you're a forefoot striker, or a midfoot (landing lightly on the heel, with rapid transition to the forefoot) striker, this won't be a problem. 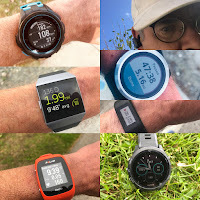 However, for obligate heel strikers, who land heavily on their heels and absorb the full impact before transitioning, I suspect that the amount of heel cushioning in the Runventure 2 will be insufficient. As with mountain bike tires, there's no one outsole material and tread pattern that excels in all conditions. That said, I really have no critiques at all of the Runventure 2's outsole. Superb outsole in Runventure 2 grips well on everything and still feels smooth on the pavement. The Runventure 2 has a similar tread pattern to the MT-2, but with deeper lugs and traction was noticeably better in steep, loose terrain. 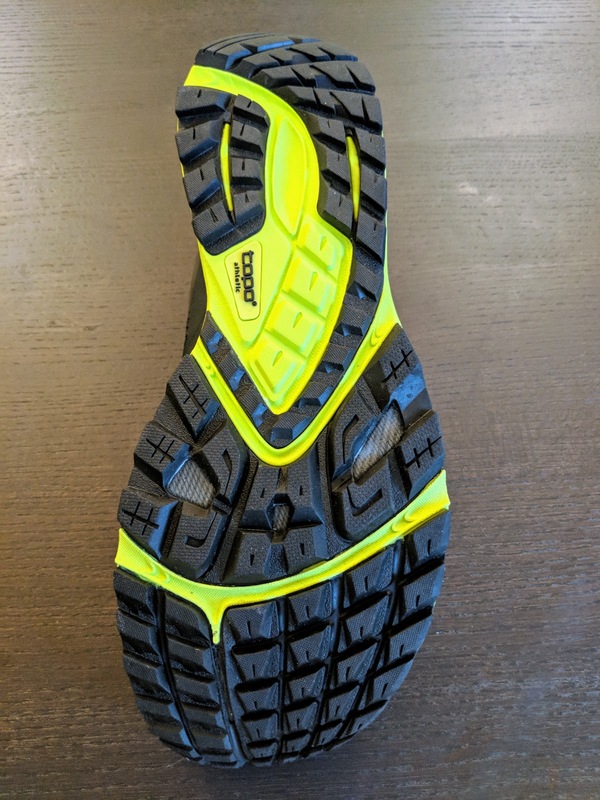 Despite the deep lugs, because they are a good size, and closely spaced, the shoe still runs well on road without pressure points. It doesn't rain much here in Los Angeles, but I was able to test the Runventure 2 on one very wet day. Unfortunately every angled surface became a slip-n'-slide. 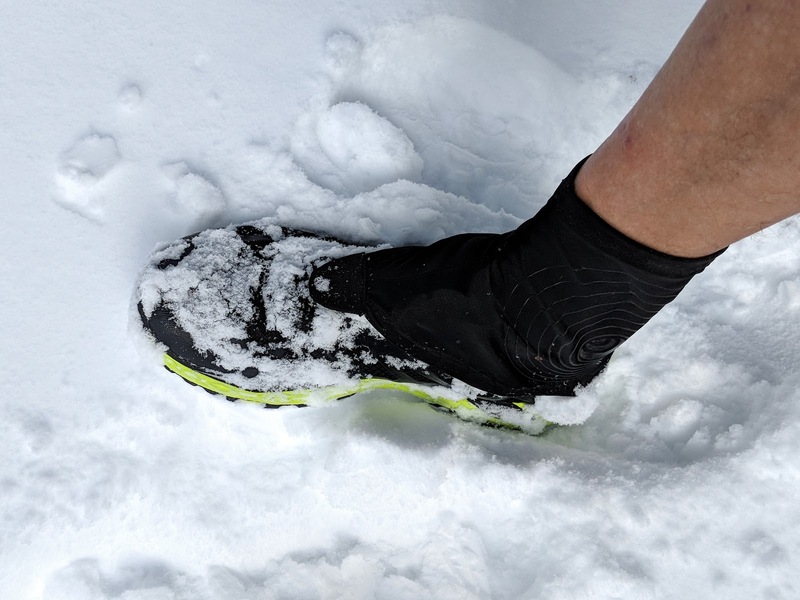 Given the exceptionally challenging conditions, I don't really know if any shoe could have kept me on my feet. The following day, the trails had dried enough that there were just a few slick patches, and I felt Runventure 2 gripped well. One issue that I have encountered with the Runventure 2 is that the foam used in the insole loses volume. Under areas of high pressure (e.g. ball of foot, heel), the foam compresses and becomes paper-thin. 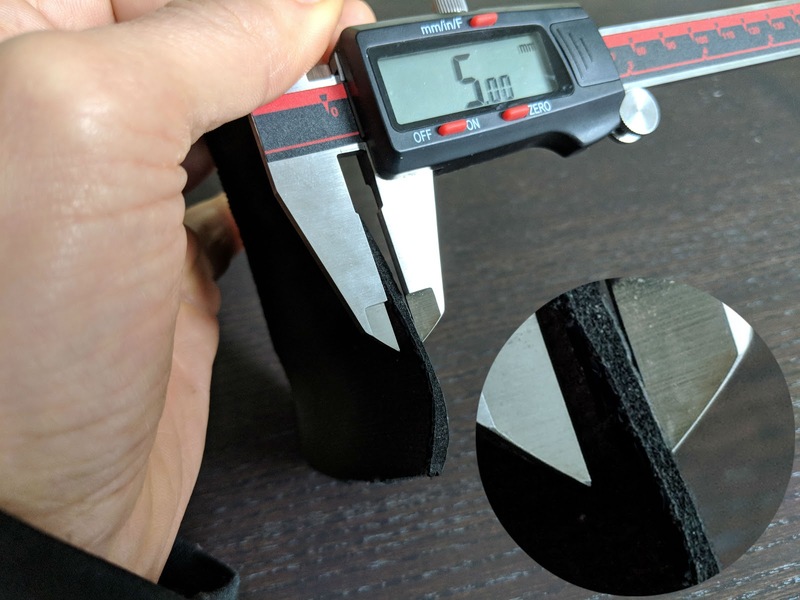 Quantitatively, I measured the insole thickness to be 5 mm at the perimeter (i.e. uncompressed) and 2 mm after. This deterioration of the footbed happened over the course of about 100 miles of running. I observed the same thing in the Topo MT-2, which uses the same insole. One could argue that this it is part of the break-in process. I didn't find that it made the shoe discernibly loose, but it did seem to diminish the amount of cushioning. 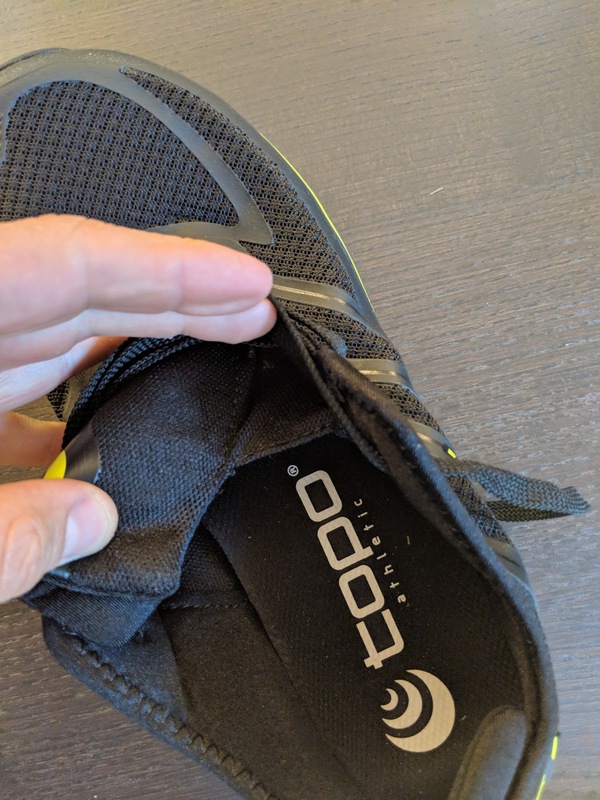 While most insoles do lose a little thickness over time, in my opinion the compression of the Topo insoles was excessive. This is certainly not a show-stopper. The fit of the shoe wasn't noticeably compromised. Moreover, most shoe geeks keep on hand a selection of spare insoles. I regularly switch out the insole supplied with a shoe to fine-tune the fit according to the socks I'm planning to wear, and distance and terrain I'm running. 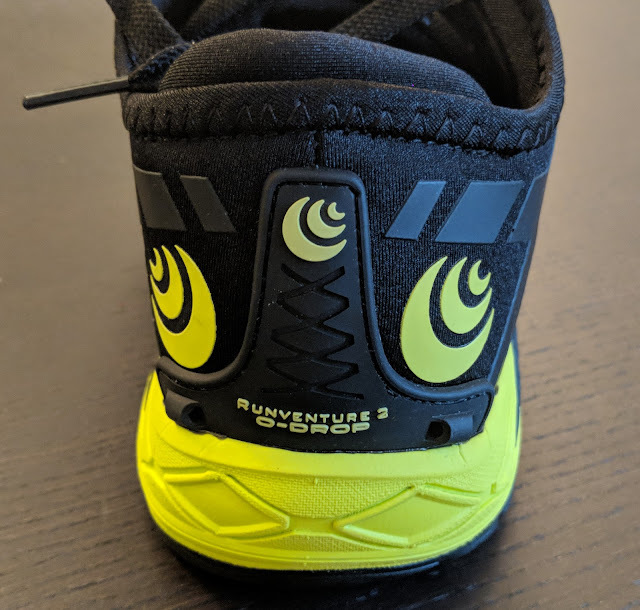 I really like the Runventure 2, but I am uncomfortable describing a shoe as flawless. In that spirit, if I'm searching for areas of improvement, I might also mention that I felt the upper was lacking in stretchiness. Some shoes with stretchy uppers trade comfort and ability to accommodate different foot shapes against foot retention. Stretchy shoes can feel unstable on off-camber trails and technical terrain, or allow the foot to slide forward on steep descents. So there's definitely such a thing as too much stretch in a trail shoe. The Runventure 2, on the other hand, probably has too little. Getting the perfect lacing tension was finicky. Just a little loose and the shoe felt sloppy; just a little tight and the shoe felt constricting. The 'goldilocks' range was very narrow. Topo might consider switching out the (again, relatively inelastic) laces for some that have a little more stretch to them. The Topo Runventure 2 is an excellent, lightweight, zero-drop trail shoe. It offers an outstanding low-to-the-ground feel, with surprisingly good rock protection at a competitive weight. Fit is moderately wide in the forefoot, with an overall shape that matches my feet well. This is a very innovative, adaptable shoe that performs well in many different conditions. I would -- and do -- pick it for daily training on almost all terrain. I would also happily wear it for races in the marathon to 50-mile range. 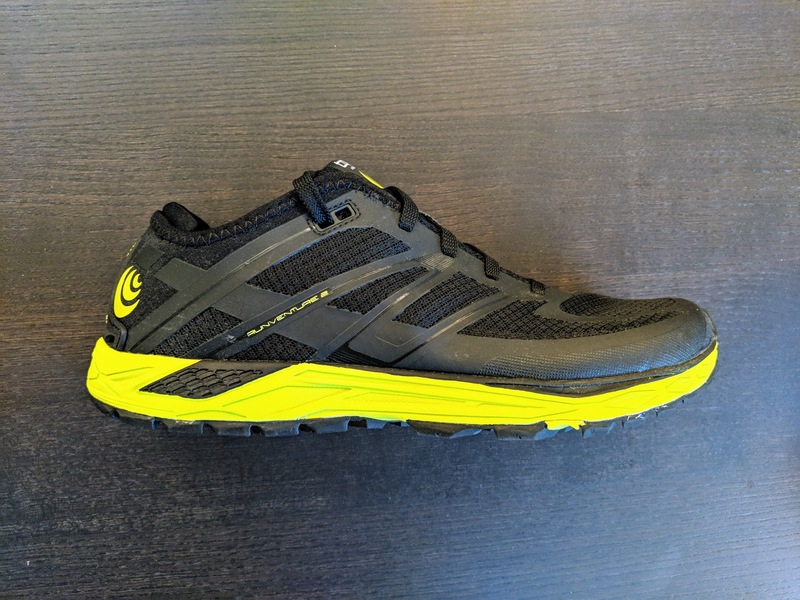 However, if you're a heavy heel-striker, need stability features, or are just a runner who enjoys a lot of cushioning, the Runventure 2 is probably not the shoe for you. My quibbles with this shoe were exactly that: very minor issues. Overall, I loved the stripped-down, unstructured feel of the shoe. And it aces the all-important "shoe that stays on the top of the sneaker pile" test. Kudos to Topo. Not much cushioning. While not a minimal shoe, this is far from a plush ride. There may be better choices for heavy heel strikers. With extended use, insole foam compresses and becomes paper-thin under pressure points. 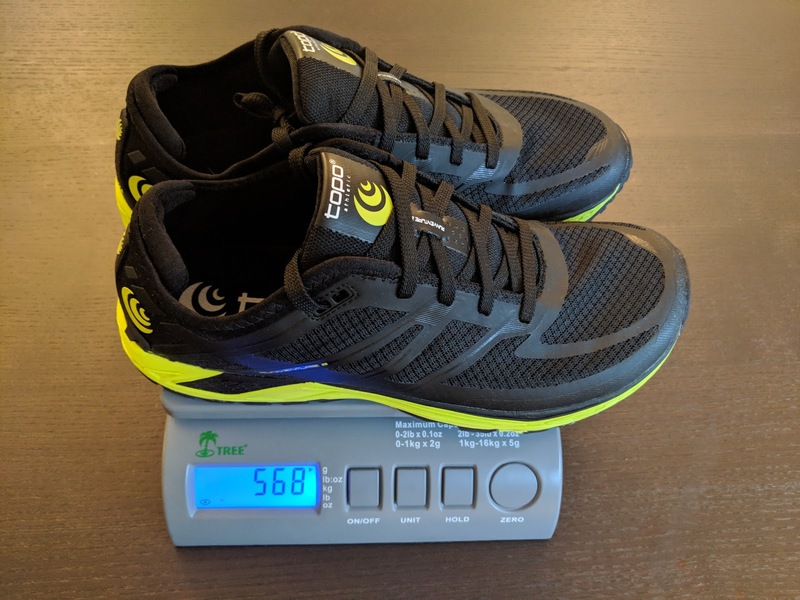 These shoes are surprisingly similar in ground feel and nominal stack height (TK4 is 20 mm forefoot, RV2 is 19 mm), and also weight (measured weight is within a few grams). I had to size up ½ size in TK4 like many Nike shoes. Whereas Nike takes some time to break in, RV2 is ready to race straight out of the box. For my feet, midfoot retention is slightly better in the TK. 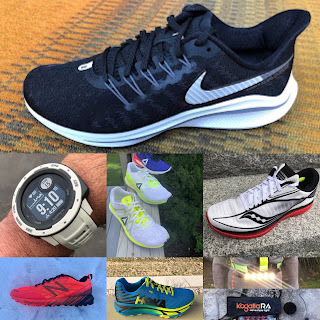 Otherwise there’s little to choose between them -- and I intend that to be a major compliment for the Runventure 2, as the TK series have been among my favorite shoes for several years. Another shoe right around the same weight range. However, while the Runventure 2, Altra Superior and Nike Terra Kiger are all broadly similar in character, the Mazama is much less conventional. It has both a narrower forefoot (unusually snug for a Brooks shoe) and a stiffer sole with even lower stack height (15 mm in Mazama 2 vs 19 mm in RV2). Mazama also has a more conventional 6 mm of drop, compared to zero in RV2. I had to run with an MT-2 shoe on one foot and RV2 on the other to tell them apart. Despite the differences in construction, the shoes feel very similar. I didn't notice the 3 mm of drop in the MT-2 compared to zero in the RV2. The MT-2 feels slightly plusher, more squishy underfoot. On trail, the RV2 has improved traction from its increased lug depth, and better rock protection. Brooks Caldera 2 [RTR review], Hoka Speedgoat 2 [RTR review], Topo Terraventure [RTR review] are all within sneezing distance of each other, weight-wise. All are slightly heavier, and offer more support and protection than the Runventure 2. Downside is higher stack and diminished trail feel. Personally, I would consider these more “100-miler” shoes. All are great choices, and I’d have a hard time recommending one over the other. Dom lives in Southern California after several years in Park City, UT. He is an avid trail runner who likes to race. He holds a PhD in biomedical engineering from MIT, and has worked as a researcher in orthopedic biomechanics. In 2016, he raced, among others, the Angeles Crest 100 (2nd place), Scout Mountain 80K (1st place), and Georgia Death Race 68 miler (3rd place). His 2017 achievement include first place in the dead of winter 2017 108-mile Spine Challenger race in the UK, breaking the course record by an hour, 1st place in the Quicksilver 100K in California, and 14th at the Western States Endurance Run. In 2018 he finished 7th in the Georgia Death Race. The Runventure were provided at no charge. The opinions herein are entirely the author's. Great review! Do you know if Topo's going to update the MT2, maybe with an upper with less overlays? Don't know the answer to the MT-2 overlays question. Will find out or someone from Topo may chime in. 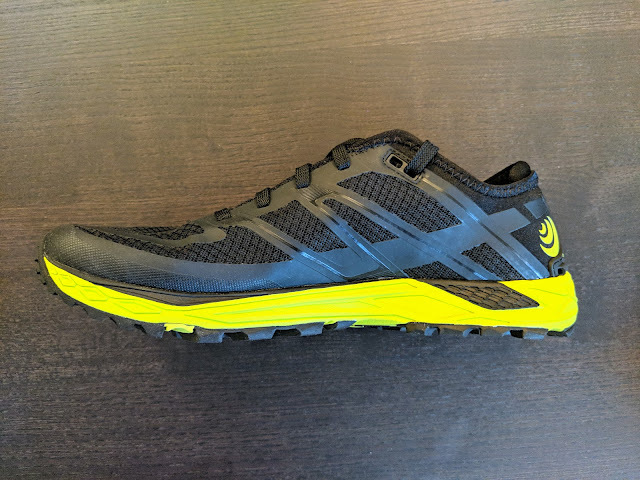 My main worries about this shoe is use in rocky and technical trails, right now my feet are other happy with the current pair of superior 3.0 mainly due to lack of protection. And they are also unresponsive and the midsole has lost pretty much all zest, and with the rv2 being similar in stack height and materials I don't want to end up in the same boat of feeling like I'm wearing clogs. The midsole test for the rv2 worries me in that regard. And I would expect a shoe to be in decent shape for at least 600km, something my second pair of superior 3.0 has not managed to do. The insole getting thinner is not unusual. It's only something that I've noticed since I started running in the mid-80s with all standard EVA insoles. In fact, I count on this flattening to free up a little bit of extra volume in a pair of shoes. It's noticeable after the first ~10 mile run. 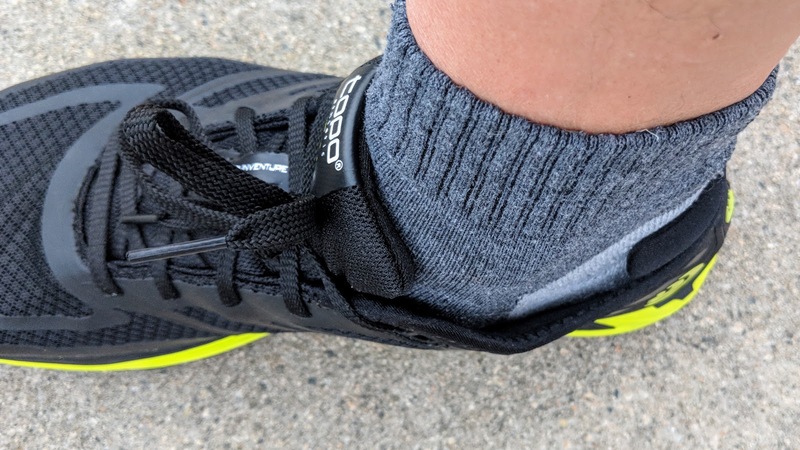 That loosening up you feel in shoes after the first 10 miles is this, not the uppers conforming/stretching (if they were typical nylon uppers, and it actually was the upppers, it would be an indication that they were starting to tear...). I've sometimes taken insoles out of cross country ski boots or cycling shoes and put them in my running shoes for a 10 mile run just to get the same effect on purpose. Re: insole compression. Perhaps I should have been clearer in the review. As you (Anonymous) say, something similar occurs with most insoles, depending on the material used. It doesn't seem to significantly affect the type of blue foam that Ortholite uses. But I've never seen the pack-out occur to this extent before. Also, the more minimal the shoe, the more any loss of cushion is apparent. Version 1 had a black lining behind the red mesh. Does this laso have some kind of lining? Hi Pug, sorry for the delay commenting here, busy times. MT2 is on schedule for an update in May 2019, however, we have 3 new trail shoes you may find quite interesting coming around Thanksgiving 2018, including Terraventure 2 and Hydroventure 2 -- stay tuned! Thanks for the review. Any comment on the width of fit? I have a widish foot and high volume foot most shoes are too narrow through the midfoot. The only Altra that I find wide enough is the Timp.